Samsung has had the Galaxy S4 smartphone on the market for a long time now but ladies have not received yet their version of the company’s flagship smartphone. Well, now they have a reason to celebrate as a women-oriented version of the Galaxy S4 will be ready for Valentine’s Day and as usual will carry the La Fleur designation. As with other models the Samsung Galaxy S4 La Fleur will have nice girly patterns on the back of the smartphone and will be available in white and red colors. The smartphone will be based on the Samsung Exynos 5 Octa processor and will have a 5-inch Super AMOLED display at Full HD resolution (1920 x 1080 pixels, 441 ppi), 2 GB of RAM, 16/32/64 GB of internal memory, a microSD card slot (up to 64 GB), a 13 MP rear camera, Wi-Fi, Bluetooth v4.0 and a 2600 mAh battery. The device will run Android 4.2.2 with a custom interface. 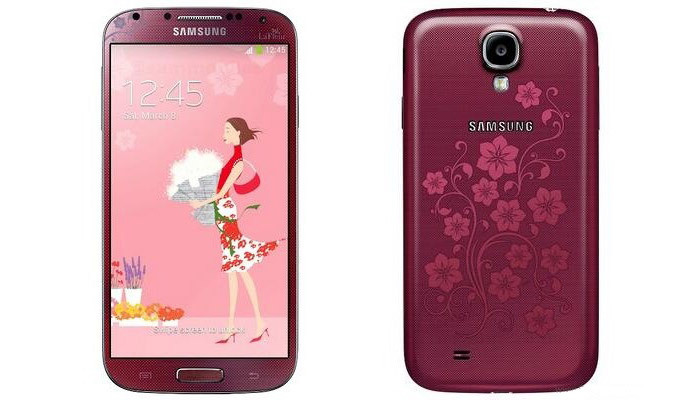 The Samsung Galaxy S4 La Fleur will appear in February 2014 but the pricing of the device is still unknown.